**If you want to save your search results you must create an account. Click on each filter along the left side of the screen and answer the questions within each filter. Note that you can indicate the degree of each filter area from “Don’t care” to “Must have”. “want” instead of “must have”. Add colleges of your choice to your favorites. Wondering where to go to college? How much will it cost? What do I need to get in? What does the campus look like? Below are some websites to explore to help you learn more about various colleges. Is a degree program you’d like to pursue not available in your state? Is out-of state tuition a barrier to a major offered at a college in another state? Looking for options with lower tuition? Be a resident of one of 15 participating SREB states. Select a program eligible for residents of your home state. Complete the admission process at the institution that offers the program. Be certified as a resident of your home state by contacting your state’s ACM coordinator. Students coming to Northeast State for their College Day must have an appointment with NES. 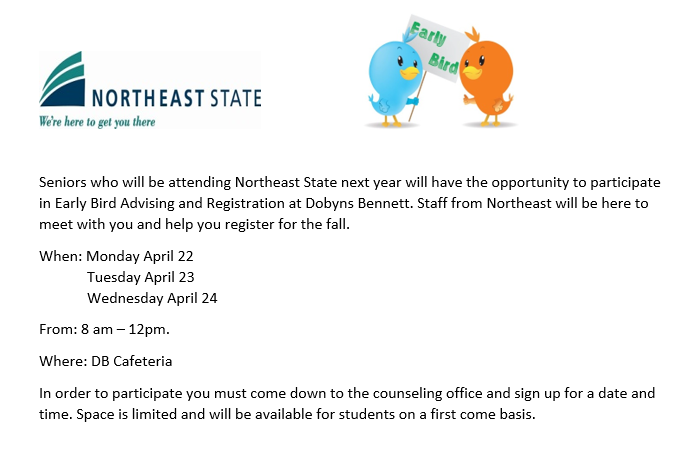 Appointments can be made in one of two ways: 1) calling 423.323.0243, or 2) signing up online via our website www.NortheastState.edu and clicking on the Campus Tours link at the bottom of our homepage. Campus visits normally last an hour to an hour and a half and include an overview of the college facilitated by one of our enrollment specialists followed by a campus tour led by one of our students. Make sure following the campus tour to return an excuse from NES to D-B attendance to count as a college day.